Regiment/Catrawd: 4th Battalion, Welsh Regiment. Service Rank and Number / Rheng gwasanaeth a rhif: Private No. 82702. Military Cemetery/Memorial / Fynwent milwrol: Rhyl Town Cemerery. Ref No Grave or Memorial / Rhif cyfeirnod bedd: 2794. Died in hospital aged 32 years. Charles John Hall was born in Birmingham, England during 1887. Nothing is known of his early life, but in April 1911 he was living as a Boarder at 25 Queen Street, Rhyl, Flintshire and employed as a Hotel Porter. He later married Mary Ann Jones and they lived at 7 Vale Road, Rhyl, Flintshire. During 1918 he enlisted with 4th Battalion, Welsh Regiment at the Recruitment Centre, Rhyl, Flintshire. He did not serve overseas and died on 8 March 1919. 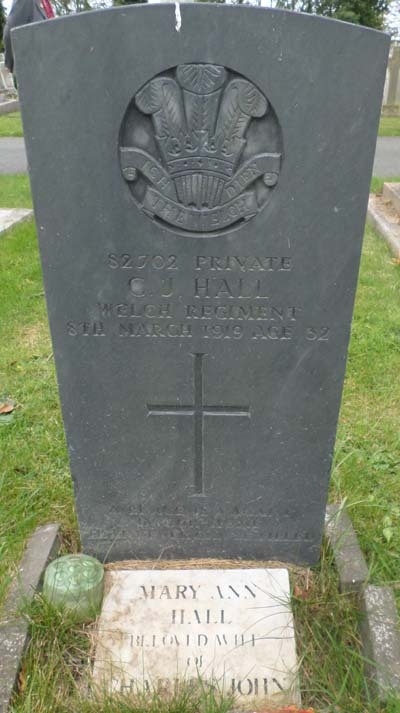 Photograph taken by Geoffrey Mitchell on Friday 9 October 2015 of Private 82702 Charles John Hall’s headstone at Rhyl Town Cemetery, Rhyl, Flintshire. There is a Flintshire Roll of Honour Card for Charles John Hall at the County Archives Office, Hawarden, Flintshire, which is dated 13 September 1919 and signed J Williams.